Tolerating Ethiopia’s occupation of Eritrea’s sovereign territory is affront to international law and a disservice to peace in the Horn of Africa. TODAY marks 12 years since the Eritrea Ethiopia Boundary Commission issued its final and binding decision on the common border between the two countries, fulfilling a major part of the mandate entrusted to it by the Algiers Peace Agreement of 2000, a peace agreement that saw a cease fire of a 3 year border war. Unfortunately, today also marks 12 years that peace has been held hostage as Ethiopia refuses to abide by the final and binding ruling of the EEBC and still occupies sovereign Eritrean territory. If all would have gone according to plan–in other words, if Ethiopia would have honored its treaty obligations–the border would have been fully demarcated by November 2003. Although Ethiopia refused to allow the EEBC to finish its mandate by putting pillars on the ground to delineate the border, in November 2006 the Commission issued a statement saying it was obliged to adopt another approach, namely that of virtual demarcation. This being the case, the border does exist; the problem is that Ethiopia refuses to leave Eritrean sovereign territories. Twelve years ago, 13 April 2002, the Ethiopian government was quick to celebrate the final verdict, but for some reason soon after, they took back their celebratory words when they came to realize the disputed town of Badme was awarded to Eritrea. Awkward is the situation since Badme doesn’t possess any natural resources that would make one want to keep a hold of it. No, the reason why Ethiopia doesn’t accept the EEBC ruling is because Ethiopia, Eritrea’s ex-colonizer, does not respect the independence Eritrea gained after a bitter 30 year armed struggle and a referendum that had 99.8% of the Eritrean people vote YES for independence. In a bid to prolong this hostage situation of peace, Ethiopia propagates that there is a need for ‘dialogue,’ without taking a single step towards making a situation for dialogue possible. The final and binding ruling of the EEBC cannot be reversed under any circumstances, and Eritrea has officially repeated time and again that if Ethiopia withdraws its army from occupied sovereign Eritrean territory including the town of Badme in the morning, dialogue between the two countries would start in the afternoon. So indeed, the grand question is why does Ethiopia insist on holding peace hostage? 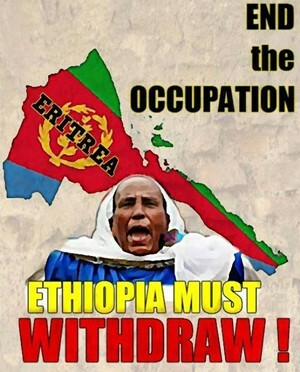 Ethiopia must end its occupation of Eritrean sovereign territory TODAY! why don't you just kick them out? Because war only benefits arms manufacturers, which Eritrea and Ethiopia are not. We're trying to end the vicious cycle of Africans having to resort to violence to settle their differences. Eritrea has seen what war brings, thus the reason why it doesn't envision engaging in it anytime soon. It's quite simple my friend, why fight for something that has already been declared yours by international law? Unless we rise up to the occasion demands, forge our unity and remove our internal and external enemies, we will lose it all. If it doesno't benefit the two countries it should not have started in the first place ! Since when did you get that enlightenment?! why start the war in the first place then? typical HGDF! you have to get kicked in the groin to understand the consequences of your actions! " e'zuy kit'gieta do tirhxa " yibilu abeyti. Hahahaha you been kiked out of where u were.now you as all talking the opposite. Again if you want we will kick u out from where u r now. Terry, it is not because we couldn't kick them out, we can and if necessary we will. But since the law is on our side, there is no reason to spend any more Eritrean life for a cause that is already on the books of law. Trust me these scumbags will be forced to vacate all our occupied territories once the appropriate times, which is around the corner. Terry, watch, they are not only be kicked out from our land, But their fait be the fait of the Derg. Just have patience. Mussie the professional(lol), how many years should we wait? Hahaa….when you come to sovereignty the matter is not about Woyane, it's about Ethiopia. For that matter we will sweep you all Shabiyans if we pee on the border, you all are as simple as that! Is it Ethiopia which was biting the neighboring countries: Yemen, Sudan and Djibouti ? You could even fight if Red Sea were a country, very similar act of a mad dog. You got the treatment when you came to Ethiopia after invading us and attacked hundred of innocent people, women and students in school. If you kicked us why did we penetrate only 100 Km away from Asmara?!! Why didn't you stop?! I am sure you will never even dream late alone to confront us again. B/c you know it very sure that it will be your last just in a couple of days. YOU ARE NOT PEACE CHANGE YOU NAME ENDLESS WAR GET LOST. Peace this comment it is not to you.It for apl retarded . haile sellasie said it, woyane siad, derg said it. Ethiopia can only urinate. We know you urniate that is the sign of poor mind. your urnie is going to come through whcih river tell me. is it coming from agam land or from amahara land . The ormoas are going to wipe you out so you better shut up. Simple bravADO IS THE MARK OF ETHIOPIAN AMAHARAS AND WOYANE BAGGARS. tHE ORMO PEOPLE ARE ONLY AFTER THEIR BUSINESS, i DO NOT HAVE ANY HATE TOWARDS oROMOS OR tHE OTHER NATIONALITIES. Well said Rahael, The inferior Woyanne slaves in their thick empty skull thinks, they are smelling ocean breathe by staying in Bademe, not knowing their fate is to lose the small river Tsana River very soon . Dear Ermias we know war more any other nation Eritrea has been in war for very long time, not because we love war, but out of gregarious violations of our rights. I can assure that war have devastating effects on both sides both sides However in order to live peaceful as neighbors one need have political maturity of theirs leaders and their people. Ethiopia need to respect the rule of law not the rule of jungle. That why the Eritrean government did its utmost effort to avert the war for example The Eritreans government wrote several peaceful letters to Weyanes leaders concerning the situations at that moment but weyane had bigger agenda in their minds that is to establish abai tigriay their poor calculation was their problem these vagabonds weyane leaders had unattainable dreams but Weyanes need to wake up the ball in their court. weyane have counted days no brob Eri. people..
You can eat bread on you dream.hhaaaaaa. I'm eritrean . I think Eritrea is very weak now our nunity is not strong as it was before, especially the youth are very angry with hegdef. The bademe situation is like Iseral occupying Soryian Galon Heights. The only way we can get back is to throw iseyas get our unity back cuz iseyas is weak economically and diplomatically !! Look up and see how many of the Eritrean commentators started their paragraph with, "I'm Eritrean". That's the dead giveaway that you are nothing, but a scumbag south of the border. And of course, your typical envious-obsession with our president simply confirms that fact! You're an embarrassment to Weyane, because the one thing you guys are really good at, is deceit! I will add that Woyane are a lowlife scumbags who are ashamed of not only who they are but also what they stand for. You can smell these idiots from a mile away. They want to be Ethiopians when they wan to loot in the dark when no one is watching. They pretend to be Eritreans when they are cornered and they want to be Tigrayns when they see other being proud of their heritage. They are nothing but an utterly confused shams and lowlife beggars who graduated in 1991 to thieves and scavenger midnight hyenas. This scumbag agame doesn't even know how spell our beloved president name right. first of all you are not Eritrea. You pretend. typical agame mentalilty. All agames have changed their names. They call their names, Netsane, Wedi afom, Wedi ere, simon, binyam, semhar, and so and so. I saw one tigraway calling himself Esayas afeworki to claim asylum in Europe. I laughed. No wedi eri, You are agame, From Tigray but pretending to be so that to tell us about our country. Go to hell no one is foolish here. You better write as Agame. I like agames saying I am tigraway. that is the best feeling I give them respect. when they say wedi Eri, tht is the time I trash them into the dust bin. Wedi ere you are dead lier, typical agame. I never tKE AGAME NAME, i NEVER WANT TO BE OR LOOK LIKE Tigrway, or Ethiopian I have the best country and best heritage. There is this saying in english. ''If u can't beat him,join him". Why cry for 12 years woyaneee……bla bla. If u can't beat ethiopia(the then weak eth. )in 1998-2000, HOW on earth are u gona beat the mighty ethio now. I am seriouse guys. are u guys dreaming like ur mad leader.Ethiopia is the super power of east africa.look our troops are in somalia,sudan(darfur) south sudan(abiey) etc.Even the Egyptians can't dare to attack as when we build the dam which is the tap for nile river. switch on(water) and off(no water).Eritrea spend 20.9%of total gdp for military,ethio spend 1.2%.compair guys.it remindes me that the frog and the elephant thing.so to make it short.we are not enemies of eri people but HGDEF.don't scare us lets talk and take your badme.other wise u are going to cry until esu died.if lucky a better person will replace him if not u will cry for the next how many yrs.So if u can't beat him……………………………….,u guys finish the sentences. Tesfa News,my posts have been blocked many time,why?.. "content is important" we should be given same opportunitie to free expression.Your action is ridiculous when i read posts to defame our nation,shame on…. ethiopia cannot colonize, but was helped by its master USA and UK. Eritrea was federated with it borders, parliament, police and flag, its laWS AND INTERNAL afairs to be run by the highly deelopmed Eritrean economy and Eritrean advanced laws. Haileselassie feared the challenge and by force annexed the indepedent Eritrea against the will of the Eritrean people. The day Hailesellasie violated the federal system, on that same day Eritreans shoot the first bullet. Ethiopia was not colonozed at all. But Eritrea was. That meanse Eritrea was not Ethiopia part any time in history. You cannot calim any territory fom Eritrea. The woyanes tried everything to assert that. But there is no a single loophole that entitles ethiopia to claim anything from Eritrea. by AU charter all colonial borders are respected. Ethiopia itself can be swallowed if it does not respect the colonial border . Ogaden will go, oromo will go, ETHIOPIA MAP WILL BE TIGRAY, bEGEMDIR, WOLLO. CAN YOU DRAW THAT PICTURE> IT WILL LOOK LIKE SMALL FLAT BREAD. dEAR tESFANEWS PLEASE BLOCK THE POSTS OF tERRY. tERRY IS AGAME NAME. iT IS jAMAICAN NAME AND THIS AGAME BORROWED IT. BLOCK HIM OUT . IT IS GOOD HE IS NOT NEEDED HERE. Badme is in Eritrea. that is the main thing. One day sooner ethiopia will vacate. For us now we concentrate on respecting the law. We always respect the law. those who do not will do one day. We beat ethiopia demolishing 500,000 army many times. in 30 years war and woyane army 500,000 was beaten and run away and signed the Algeris Agreement. Alegeris agreement was signed by woyaqne well knowing it was a defeat for them. Then started dancing the EEBC decision was sound and good. Then they started to drag their feet. This is not a sign of strentght. You better shut up d not talk on things that you do not know. We understand why woayne draging feet is because it will be suicide to say we are leaving Badme. That is the on,y reason. ~they are ashamed by their actions and want to make some agame like you happy for a time being. That is why you come here saying, take it by force, take it by force. That is the only thing you can say. You do not have anything alse to say. Because you do not have any other idea, We do not have reasing to go to war.,We do not have issues that take us to start war. The border is demarcated bysuper, powerful virtual demarcation. if you want to see where Badme is go to tHE BORDER WITH YOUR GPS AND IT WILL TELL YOU EEEEEEEEEEEEEEMMMMMMMM. STOP HERE. THE gps WILL TELL YOU.bADME IS IN eRITREA. Is there anything better, clearer, stronger evidence than this that Eritrea under the leadership of the super Leader wedi Afom achieved . Wedi afom you do not like him because he defeated you in the war, in The court and in International Law and diplomacy. Ethiopian diplomacy is begging, lieing spreading remours and false information. Woayne does not know diplomacy, but leuing, conspiracy . Eritrea is the most strong country in Africa, nd that is Mr Afeworkis leadership and sound policy of Self reliance. Mr Afeworki never beggs, Never bands and bows the amercN WOYANE MASTERS. hE TELLS THEM STRIGHT ON THEIR FACE i AM mR aFEWORKI OF eRITREA, WHO FOUGHT FOR INDPENEDENCE, SELF RELIANCE AND EQUL PARTNERSHIP. Mr Afeworki went to america to tell the UN that Amerca is our enemy. He was not afriad of anything. Unlike meles who beggs for left over, for political, economic and budgetary money and bends 10 times for the hand outs. So you woyes better stop it. We are not the same people. We are free, Independent and own our own policies, and choices. Ethiopia is a servant country.that send soldiers to fight amercian wars. So you hate Afeworki, because he is different, the direct opposit of woyanes. So I no wonder why you call his name 1000 times in a page even if the topic is something different. Enjoying the 12th anniversary of the Eritrea Ethiopia Boundary Commissions final and binding decision issuance. RiP! The EEBC final and binding decision Manifesto. So let me get this straight. In 1998 we went to war with ethiopia for what was then a disputed badme. Today, we are refusing to go to war for a Badme the eebc said belongs to us. Shouldn't our actions be the other way around, that is to avoid war over areas not declared ours and to wage war over areas decided ours? We Eritreans have our country, our flag, our ports. Others can lie, deceive, beg…we don't have time for that. This is the time for rebuilding our country. Woyane is exposed and continues to get exposed until they are repolsive to all the neighbors: Eritrea, somalia, Egypt, amhara , ….woyane, if I were you, I wouldn't talk cheap. Run while you can. Your day of destruction is eminent. Enough said! ZIKEBERUMN ZIKEBERKINEN AHWAT WEYANE WEYANE WEYANE……SHIH GIZIE KINEBEL NIKEL INA WEYANE N ATHASASIBA WEYANEN KISAB ZEHALEWE. KABUUU BZITEREFE AGAME AGAME AGAME ENTAY EYU TIRGUMU . KEMTI SEWATNA HANTS NEZI MEXAI WELEDO DEA YETAMO ENBER ENDABELU ZIHALEFU. EZOM TERIFENA ZELENA DIMA HIDROM TEKEBILNA AB HAGERNAN KEBABINAN SELAM KENESIFIN NIXAR.